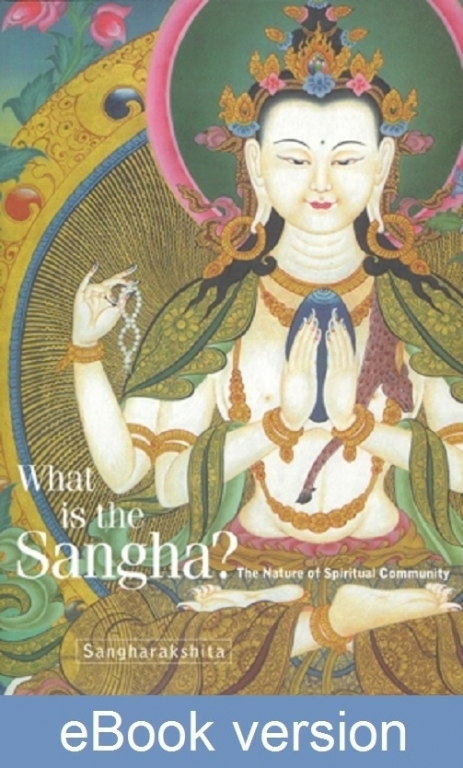 In What is the Sangha? Sangharakshita suggests that to explore the nature of spiritual community is also to examine what makes us true individuals. The Sangha in Buddhism is the free association of developing individuals choosing to help each other along the path. The usual image of the Buddha is of a man seated alone, deep in meditation. So it can be a surprise to find that Buddhism gives great importance to the Sangha, the spiritual community. Some may feel that their guru or teacher is all that they need. To others, the idea of sharing their inner and outer lives, triumphs and disappointments, with others can seem a challenge or even a threat. But the spiritual community is not about unthinking conformity or belonging to a comfortable group. Rather, it is the free association of developing individuals choosing to help each other along the path. To explore the nature of the spiritual community is also to examine what makes us true individuals. This exploration ranges from our relationships with spiritual teachers through our friends, family and fellow workers to the benefits the spiritual community can offer to the wider world.